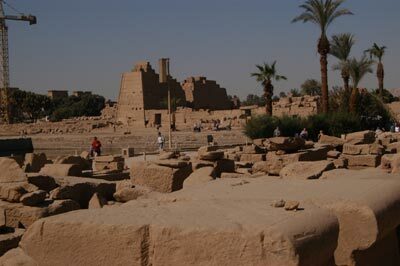 One of the other larger temples on the ground is the temple of Khonsu and the smaller Opet temple. These are int he southwest corner of the enclosure. 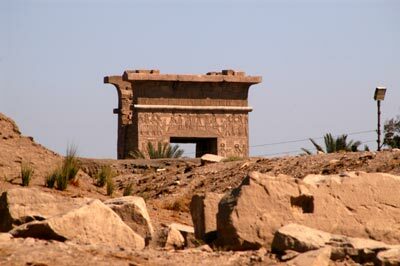 The temple was built by Ramesses III and IV, and is quite crude compared to the work int he rest of the temple. THe decorations in the dimly lit temple are mostly of the High Priests of Amun (Herihor and Pinudjem), not the pharaohs. This may mark the shift in power from the pharaohs to the High priests in the Third Intermediate period. Nearby is the small chapel temple of Opet -- the hippopotamus goddess who was the mother of Osiris -- which was built in greco-roman times. The giant gateway of Euergetes I is barred.